Beautiful countertops made from quartz tiles are becoming one of the favorite additions to any modern home. Quartz countertops can be really expensive to install and bulky to handle and this is the main reason why so many homeowners go for quartz tiles instead. A quartz tile countertop is made from engineered stone and, unlike granite tile countertops, quartz tiles are manufactured to be quite uniform in hue and color. This way, you can easily find replacement quartz tiles in order to have your current tiles matched once some of the quartz tiles are damaged or broken. Quartz tiles are stain resistant, water resistant and heat resistant as well. Also, it’s virtually impossible for almost any biological agent including mildew, bacteria or mold to start growing on a surface made from quartz tiles. Creating your own quartz tile countertop is to be regarded as an affordable and easy to do home project once you are truly willing to invest your time, money and creativity in order to create a quartz tile countertop that will not be easily damaged. In order to do this, you will need a base countertop, quartz tiles, clear sealant and specialized adhesive. All these materials can be found at your local home improvement store and they also come with the necessary instructions for you to follow. 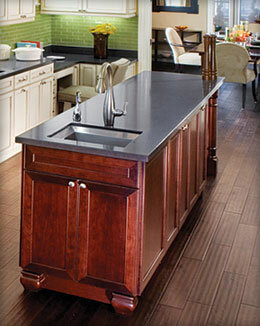 It’s paramount for you to have an exact design plan before starting to create your quartz tile countertop. Keep in mind that quartz tiles are likely to be extremely unforgivable once you have them laid into place. For instance, you should go for a design that considers the size of the quartz tiles, the exact size of your kitchen countertop, your personal preference regarding the way your countertop should look and the exact number of countertop sections that need to be joined together. Also, you should make sure that you purchase pre-sealed quartz tiles and consult with the store about purchasing the right grout and mortar s well. Here are the main steps for you to follow in order to get your own quartz tile countertop. First, you will have to prepare the necessary base that is required for the proper stabilization of the quartz tiles. Use the carpenter’s glue and sink the necessary 1-inch drywall screws – do this every 6 inches in order to sheathe the required countertop frame in the 1/4-inch cement board. This cement board should be laid over the existing laminate countertop – make sure that this top is not coming loose. But first, you will have to buff off its shine by using 60-grit sandpaper and a hand sander. Once the entire cement board is laid, you will have to fill all the existing seams with mortar – sand the board smooth soon after it completely dries in order to provide an unbroken and clean surface for you to start with. Next, you will have to install the quartz tiles. Start by laying them from the center of your countertop – work your way towards its sides and back and make sure that you keep some1/8-inch grout lines right between the quartz tiles. Make sure that the front row made of quartz tiles is hanging out right over the edge in order to cover the necessary thickness of all the quartz tiles that will be placed right on the vertical front side. Lay all these quartz tiles by spreading mortar on the whole countertop surface by using a notched trowel. Press the quartz tiles into place and cut all the edge tiles (if/as necessary) by using a wet saw. Next, you will have to grout and seal all the quartz tiles. Push the grout right into all the spaces between the quartz tiles and wipe off any excess. Let the grout sit for 1 minute and wipe everything down by using a damp sponge. Allow the grout to set for 2-3 days. Then, apply the liquid grout sealer right over the lines in order to make sure they don’t absorb moisture or stain.